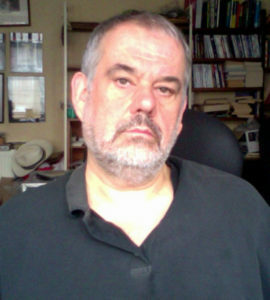 This site is run by Jim Driver, publisher, editor-in-chief and managing director of The Do-Not Press, the award-winning but feisty London publishing house, that flew the jolly roger in Britain publishing for a decade from 1994. After that, Jim went back to his original job, as one of England’s least notorious music promoters. He organised the Rhythm Festival from 2006 to its demise in 2011, and was responsible for Friday nights at London’s legendary 100 Club since 2003, since transferred to The Borderline, in Soho. After The Do-Not Press gave up the ghost, Jim’sÂ plan was to publish ebooks. And that’s just what he does now. Here is Jim Driver’s author page on Amazon.com. Since 1989, he worked as a writer and journalist, slaving extensively as beer and pubs writer for Time OutÂ (London), also reviewing crime fiction and Indian restaurants for the same organ. Before, during and after, Jim Driver wrote for ‘Oz’, ‘International Times’, ‘The Guardian’, ‘Observer’, ‘Independent’, ‘Independent on Sunday’, ‘Times’, Mojo’ and ‘Bedfordshire on Sunday’, amongst others.